“As Makemake passed in front of the star and blocked it out, the star disappeared and reappeared very abruptly, rather than fading and brightening gradually. 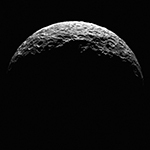 This means that the little dwarf planet has no significant atmosphere,” says José Luis Ortiz. “It was thought that Makemake had a good chance of having developed an atmosphere — that it has no sign of one at all shows just how much we have yet to learn about these mysterious bodies. Finding out about Makemake’s properties for the first time is a big step forward in our study of the select club of icy dwarf planets. 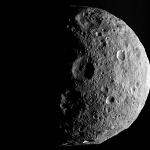 “As we respectfully say goodbye to Vesta and reflect on the amazing discoveries over the past year, we eagerly look forward to the next phase of our adventure at Ceres, where even more exciting discoveries await,” said Robert Mase, Dawn project manager, based at NASA’s Jet Propulsion Laboratory, Pasadena, Calif.
Astronomers have accurately measured the diameter of the faraway dwarf planet Eris for the first time by catching it as it passed in front of a faint star. This event was seen at the end of 2010 by telescopes in Chile, including the Belgian TRAPPIST telescope at ESO’s La Silla Observatory. The observations show that Eris is an almost perfect twin of Pluto in size. Eris appears to have a very reflective surface, suggesting that it is uniformly covered in a thin layer of ice, probably a frozen atmosphere. The results will be published in the 27 October 2011 issue of the journal Nature. In November 2010, the distant dwarf planet Eris passed in front of a faint background star, an event called an occultation. These occurrences are very rare and difficult to observe as the dwarf planet is very distant and small. The next such event involving Eris will not happen until 2013. Occultations provide the most accurate, and often the only, way to measure the shape and size of a distant Solar System body. The candidate star for the occultation was identified by studying pictures from the MPG/ESO 2.2-metre telescope at ESO’s La Silla Observatory. The observations were carefully planned and carried out by a team of astronomers from a number of (mainly French, Belgian, Spanish and Brazilian) universities using — among others — the TRAPPIST (TRAnsiting Planets and PlanetesImals Small Telescope, eso1023) telescope, also at La Silla.